According to the Greek Orthodox religion, nearly every day of the year is dedicated to a Christian saint or Martyr. Each church is devoted to a particular saint and that saint’s name day is celebrated on the saint’s birthday or day of death. These celebrations are usually celebrated with a Panigyri (fair or festival) and a religious service. Celebrations are different from place to place and different depending whether it takes place in a monastery, a village, or a town. I remember when we were kids and lived in Cyprus, on the 15th August, which is The Assumption of the Holy Virgin Mary we would travel with our parents up on the mountains of Troodos where the Trooditissa Monastery is dedicated to the Holy Mary. As hundreds of pilgrims would gather from all over Cyprus, this was a great opportunity for merchants and other vendors to brings their merchandize, which would either be livestock, or other products produced by them and sell them. (This happens at all the panigyria and even now in towns you can find them, but are more like a “laiki agora” which is a street market rather than a fair or festival. Today Cyprus has big motorways and highways and it takes only half an hour from Limassol to go up to the Troodos mountain. Forty years ago climbing up the steep roads which had only two lanes was a martyr, especially on a day like that when nearly all the population of Cyprus would gather up there. It would take two or three hours to reach. After such a tedious trip and after the service, the pilgrims would rest at the outdoor cafes, which were assembled in no time for that day and gave the travelers a chance to eat or drink a coffee or eat something sweet. One of the favourite things we could find at panigyria in Cyprus were loukoumades, called lokmades in Cyprus, (doughnuts) and shiamishi, which is only made in Cyprus. Both of these desserts are vegan. Shiamishi were, kind of square shaped pies, with a thin homemade phyllo, filled in with this a fabulous semolina cream which is scented with orange blossom water and mastic resin. It is then deep fried in a lot of hot oil and then icing sugar is sprinkled on top. This sweet could only be found at panigyria and I remember in Limassol there was only one spot where you could find them when this person was not at the panigyria. He had transformed the back of his van into a “kitchen” and would park his van on an empty corner building site on Leoforos Makariou Avenue, going towards Ypsonas village. Whenever you passed from there you could spot him because of the big queue of people waiting for their turn to buy their take away shiamishi. Whenever I used to visit Cyprus during these last 28 years I would always pay him a visit but unfortunately I recently found out that he does not show up any more. Limassol is not that big and if changed to another spot we would certainly have tracked him down. They told me that during the last years they have been making them in confectioneries. They brought me some to try, but they were not the same. 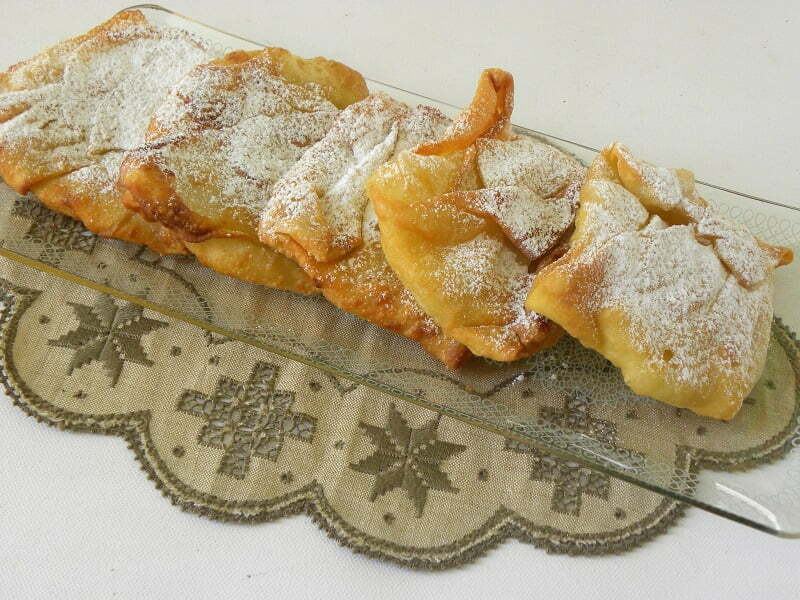 This recipe has been given to me by my sister Alkistis, which I made several months back. The dough is the usual one we make for nearly all other other savory or sweet creations with phyllo but it’s their is a technique that makes the phyllo very elastic. Combine the semolina with sugar and the ground mastic. Put the water in a saucepan and heat until tepid and then add the semolina mixture and the blossom water and stir until it starts bubbling. It should set at that point. Brush a 33 x 23 cm (13 x 9”) Pyrex with oil and empty the cream. Set aside to cool. Prepare the dough, cover with a napkin and let it rest for 30 minutes. Roll out the dough either by hand or with a pasta machine to make a thin phyllo. Cut it into square pieces around 12 x 12 cm (4.75 x 4.75 inches). Brush your working surface with oil and put the phyllo. Brush it with oil again and with your hands gently pull the dough in all directions to stretch it until it becomes transparent (about 18 x 18 cm (7 x 7 inches). Cut a square piece of cream about 8 x 8 x 1 cm (3 x 3 x 0.40 inches) and place it in the middle (but not parallel to the four corners). Fold each corner, each time brushing it with oil, like an envelope to enclose the cream. Place on a surface brushed with oil and keep them covered with cling film until you finish them all. At this stage they can be frozen. Deep fry them in very hot oil on both sides, until golden. Sprinkle with icing sugar and serve while hot. I remember that guy in the van selling lokoumades and shamishi! As a child I used to get regularly sent out to buy them from him in the evening. It is a really happy memory for me. I too used to visit every summer, until he stopped showing up. I heard, sadly, that he passed away. My mother always used to ask him for the recipe, but he said it was a secret and would never give it away. Unfortunately, he took his amazing recipes with him. I am looking forward to trying your recipe to see if I can recapture the magic! Thank you. This must be delicious. thank you for sharing.